Product prices and availability are accurate as of 2019-04-17 19:59:51 UTC and are subject to change. Any price and availability information displayed on http://www.amazon.com/ at the time of purchase will apply to the purchase of this product. 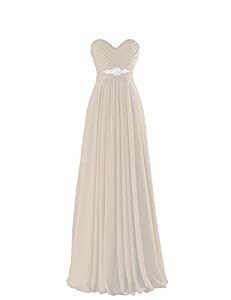 1,The sweetheart strapless A-line long empire chiffon dress is a great choice for you. 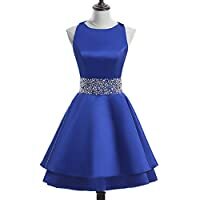 2,The dress is appropriate to be worn as a homecoming dress, cocktail dress, evening prom gown, formal party gown, wedding party bridesmaid dress, or other occasions or ceremonies. 3,If the color you need is not listed, please contact us for color fabric book,and we can custom make other color for you. If none of size above fits, please contacts us for custom make service/customized service. 1,Return and exchange may need to be contacted within 30 days since you got the dress. 2,Return address is in USA,which is easy to return. 3,Please kindly notice that custom make dress can not be returned. Please contact us if any problem before or after order,we are always at your service! Gorgeous sweetheart long floor length design,handmade,made of chiffon,soft material,good feeling,popular color,elegant,fashion,encrusted with applique,practical and perfect gift for classy and elegant ladies.Please check the measurement in product description carefully,make sure the seller is ThaliaDress to avoid buying fake items ThaliaDress,we always try our best to provide the best products to you with the lowest price. We provide 100% customer satisfication,please contact us if any problem you met. Material:Chiffon ,Back: Lace up; Custom make service is acceptable,please contact us by Amazon message freely. 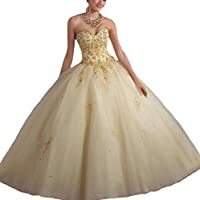 Occasion:Prom,Party,Homecoming,Cocktail,Ball,Wedding,or other formal outdoor activities etc. Delivery:Generally speaking,If you choose the expedited delivery way,you will receive the item in 2-5 days after we ship out; please use the physical address for expedited shipping;if you choose the standard delivery way,you will receive the item in 7-15 days after shipping.